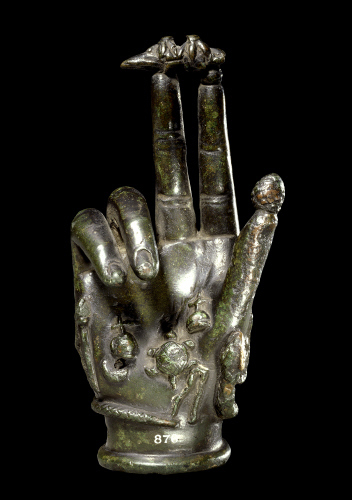 The use of a representation of the Hand as a talisman can be traced back to at least 800 years B.C., when it was used as a charm against enchantment. Many varieties of the Hand exist; in some the elaboration is very marked, each device representing some particular charm. Life size models of these Hands were supposed to guard the house against all influences of magic and evil, and smaller replicas protected their wearers from every description of harm. The extended thumb and first two fingers, the third and fourth fingers closed, is a position still assumed during the Benediction in some Christian Churches to-day.